Another basic skill a basketball player must have is passing. Having this skill well perfected will provide basketball players the ability to effectively transfer the ball from one another. A great way to improve this skill is by continually practicing passing drills. But just practice alone will not do it. Stressing the correct way of doing this drill also plays a vital role in increasing its effectiveness. Passing is required for any offensive play to work. For example, to execute the beginning of a fast break, a player who goes for the rebound needs to get the ball outside of his opponent’s half court. To do this needs a lot of practice, for this is one of the most critical stage of the play. Even professional players stress the importance of passing drills in a team’s routine.Once the ball is on the offensive team’s court, they use different kinds of of passes to move the ball to a score. Understanding the various kinds of pasess will allow better receiving of the ball. Knowing how to receive and catch a certain kind of pass will help ease the force of the ball once it lands on your hands. For these passing drills to be incredibly successful on the court, a few tips and techniques must be followed. Basic understanding of these, will increase a players effectiveness and consistency on the game. In executing any successful pass, it is always important to know the basic form and stand.Passing the ball without these basics will create trouble for you and your teammates on the court. For example, always pass the ball with two hands. Balls passed with one hand are more difficult to receive. These basic and fundamental rules must be integrated in every passing drill to create better absorption on players part. In time, these will be the bedrock of the players skills when creating their own styles in passing. Chest pass, overhead pass and bounce pass for example, all needs proper forms. Failing to use proper form will not make these passes successful. It may even cause your team to lose possession of the ball. You want the players to perfect these forms before going on to real live games. That is why constantly including them in every passing drill is important. Once a player is familiar with the fundamentals of passing, move on to the various types of passing. 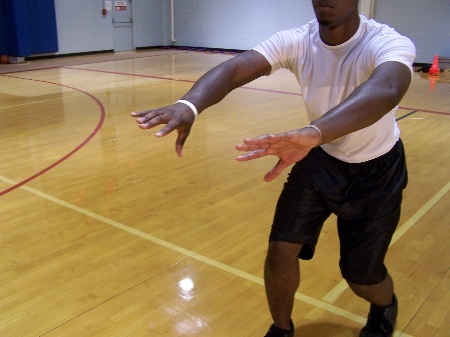 In passing drills, give players a variety of passing they can execute in real live games. These will help them in the different situations they might encounter on the court. Chest pass, bounce pass, overhead pass and push pass are only a few styles that could be integrated in practice. For example, when feeding the post, it is better to use a bounce pass rather than any other kind. Or an air pass is a better choice when doing fast breaks rather than bounce passes. Doing this different kind of pass do not only create a variety of moves for the players to play around with, it also allows them to be more creative on the court. Doing combinations of these types on passing drills is one of successful ways to ensuring these are learned well. In anything practice is a good thing. But practicing while simulating real situations is even better. Passing drills that simulate real events on the court create even better players. Learning that there is always pressure on the court gives them the ability to think quickly. Different kind of drills such as running while passing, passing while defending and fake passing are only few examples of this. Also remember to increase the difficulty of the passing drills as the players go longer into the training. This way their level will match the intensity of the practice. On the court this will translate into a smooth offensive play. Throughout these passing drills players will greatly improve their efficiency. Sooner or later they will be able to create passes with less mistakes, inturn increasing the rate of scoring on the court.